According to senior creative director Richard Farrelly, "authenticity" is the driving force behind the new Medal of Honor reboot. I asked Richard Farrelly what set MOH apart from the likes of Bad Company 2 and that colossus Modern Warfare 2. "There's only so many ways you can do a military FPS, but the things that set us apart are presentation, treatment of the subject matter, respect for the soldiers and a commitment to authenticity." Despite the game's setting in the early 2000s, Farrelly and his team approached the project as a piece of history rather than a political statement in order to fulfill their vision. "Politics is not a factor, this is historical fiction, it just happens to be set in a current conflict." The game looks good. Farrelly assured us that there will be no appreciable difference in graphics between PS3, Xbox 360, or PC versions of the game. The demo we played took us through the first few missions of the single-player game. Your squad lands in the Afghan mountains, impressively barren and sun-scorched. Resistance is greater than expected and many of your comrades are picked off by Taliban forces. All seems lost until Apache helicopters arrive to save the day. Its at this point your perspective shifts and you become a gunner on the helicopter. Attention has been paid to these transitions. The story works in these baton passing moments in a smooth and natural way, breaking the flow of the narrative as little as possible. Over the course of the game you'll play a range of characters, including main protagonist Sgt. Patterson, an Apache gunner and two different Tier-1 operatives. The bearded dude on all the promotional material goes by the name "Dusty" and will be your wingman in some of the Tier-1 missions. 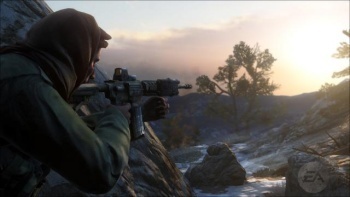 Farrelly explained the involvement of real-life Afghan veterans in the game's development, including Tier-1 operatives. The soldiers had a lot of input, advising on the script, the authenticity of weapons and dialogue, even the sound of the guns. Farrelly even alluded to a scene in the game that the soldiers found upsetting. Apparently it was a little close to home, and the scene was removed. No questions asked. "It was important to us that we do right by them," explained Farrelly. As for what that scene was, he declined to say. Medal of Honor hits stores on October 12.